I was watching some harmonica lessons a few weeks back and one those lessons was to restrict your improvisation to a single hole which gives you just 2 notes to play with. It’s a real challenge to try and play something interesting with just 2 notes and it makes you focus more on other things like timing and dynamics/volume. 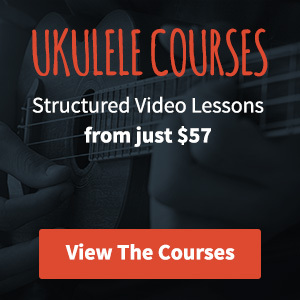 Without a doubt it improves you as a player, so I wondered how that might be adapted to ukulele. My variation on this isn’t about solo improvisation, it’s about improving your rhythm and making songs sound more interesting and varied. I set about finding songs that have only a single chord in them to set you the challenge of making them sound interesting for the duration of the song. If anyone has any to add to that list, let me know in the comments and I’ll get it updated. So let’s take Coconut by Harry Nilsson. It’s a C7 chord throughout the whole song . You’re going to need to do something with that to keep it interesting. Here’s a few versions of the C7 chord that you can use throughout. The easiest one is the one finger on the first fret of the A string. I’ve given you a couple of chord inversions to play with too just to mix things up a bit (if you don’t know what inversions are yet, don’t worry). This is a really simple fingerpicked pattern that runs in 8th notes (counted 1 & 2 & 3 & 4 &) so you’ll be tapping your foot on the first note and then every other note after that, it makes an effective intro pattern and it’s not too tough to get to grips with. Use your thumb on the G and C strings, your index finger on the E and your middle finger for the A string. 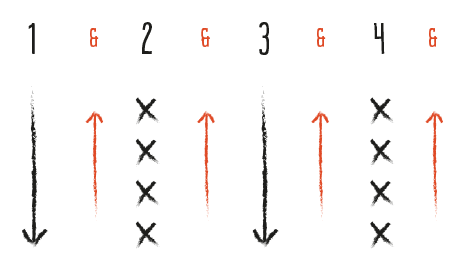 The X’s represent a chuck/chunk strum, if you need more help here you can read my post about chucking. The chorus is a variation of the above pattern but it’s a little different. Again it’s all about mixing the sound up a little. We need to do whatever we can to keep this one from getting boring. If you want a few more strumming patterns you can grab my 32 strumming patterns PDF here. And that’s it. You can add more patterns and variations if you like and you don’t have to follow my approach. Maybe you want to use the fingerpicking section for the verse – it really doesn’t matter, nothing is set in stone. You could even look at throwing some chord inversions into the mix. That’s the beauty of a single chord song – it allows you to get a little creative and start to focus on something other than chord changes. Give it a try, see how it works out for you. Now you've got one chord down, add 3 and learn hundreds of songs! This is a wonderful lesson! It’s got all the important parts right here : ) Thanks for taking the time to make this lesson up for us, I think it shines! 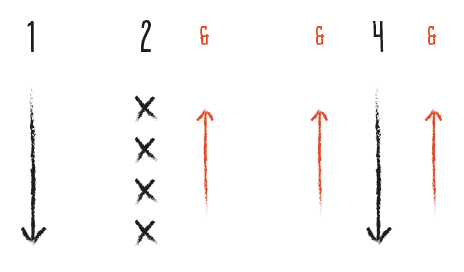 This idea of varying strum patterns and using inversions needs to be shouted loud. I listen to many uke clubs/societies/etc on YT and every song seems to sound the same. Because the uke’s are often massed and sound louder than the lyrics, the melodies don’t really seem to help. This is a great post and the point should be hammered home. Thanks for the comment John – I think you’re right. I’ve listened to a few groups and I know what you mean. I think chord inversions are a big help here too. Although I don’t play with a club/group if I did I’d almost certainly look to be using chord inversions to mix it up a bit. This is a great idea Ben, I love the idea of a single chord medley. I’ve also done it with “Chain of Fools”in the place of “Electric Avenue”. It’s a lot of fun when you get a couple hundred people all singing in three parts. Thank you so much for leaving this comment. I tried it with my kids today – 1st, 2nd, and 3rd graders. They LOVED it!! Who knew you could have so much fun with just the C chord. Do you have a recording of that? I’d love to hear it! This is a little different version, with “Chain of Fools”, “Coconut”, and “Shimmy Shimmy Ko-Ko Bop”, recorded at a concert in Mason MI. So glad to find this list! I’m working with a 4 year old little boy with mild autism. Right now, one chord (C) and keeping a beat is all we are doing. But I can add the C7 songs now and – maybe – shoot for F in time. Very helpful!!!! Hey Jody, really pleased that you’re finding it useful. Also, top marks for teaching a 4 year old! I have a 6 year old and I can’t get him to play a note.